A wanted poster is mainly meant for any individual whom the police considers as harmful for the community. These posters usually feature a big head-shot of the wanted person followed by his or her name below the image. 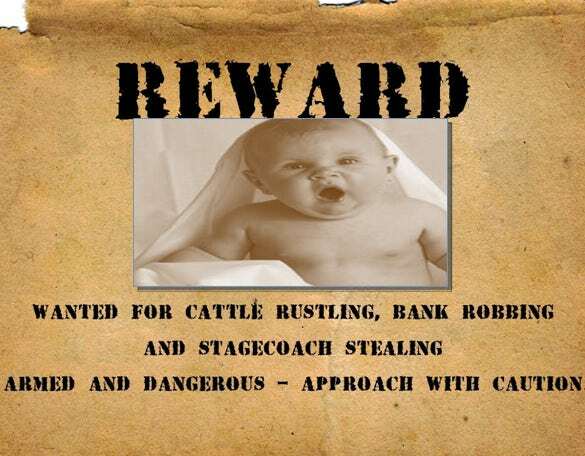 Sometimes, the police also declare a monetary reward for anybody who will find the wanted person and reward value is mentioned on the poster. A Wanted Poster Template PSD sample offers you a pre-structured space to enter the photograph of the wanted person easily. 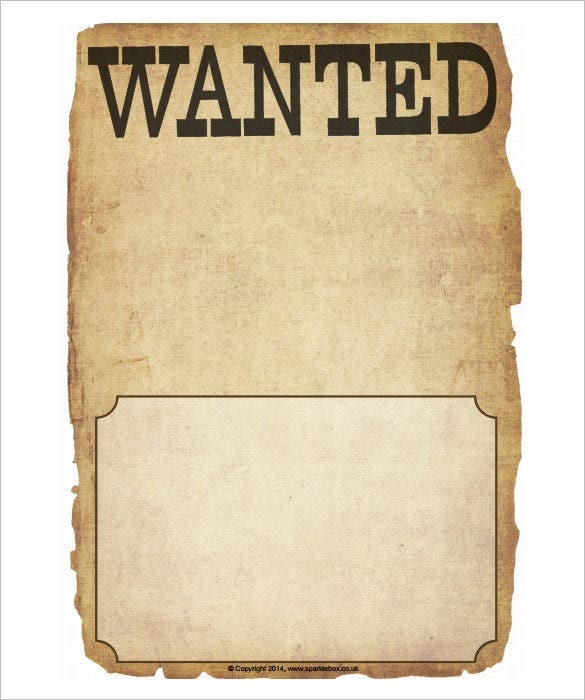 The blank template wanted poster is a free and easy to download poster. This poster template can be easily edited. There is space for the user to add the photo of the wanted person. One can also add the reward amount on this template. 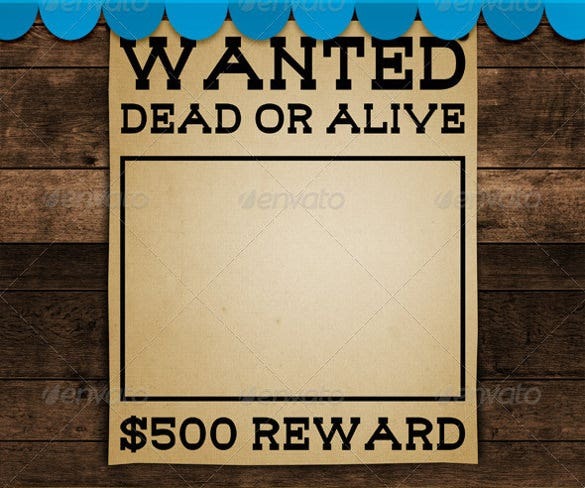 A wanted poster template word sample is usually a detailed poster which notes the name and crimes committed by the wanted or escaped criminal accompanied by information on the reward and where to contact if anybody finds him. The poster would also include one or multiple photographs of the person. 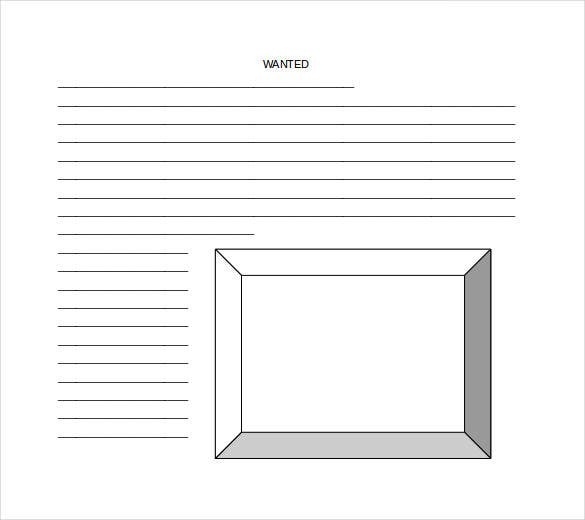 primaryresources.co.uk | The blank wanted poster template is a Word compatible document. The user can add content about the wanted person, reward amount and even include the picture of the wanted person. This template is more suitable for the purpose of email. 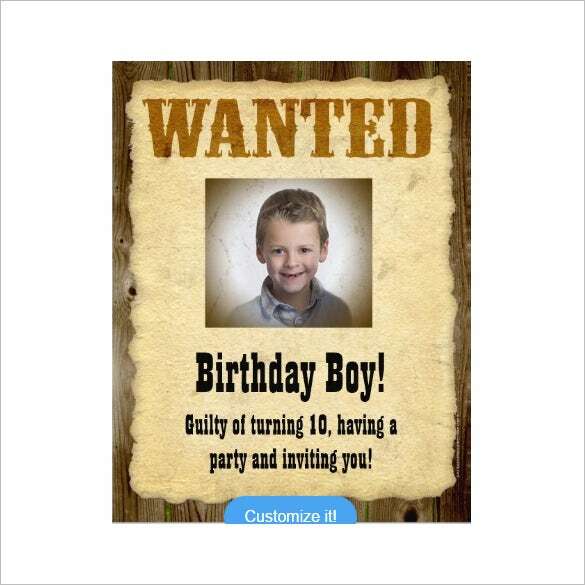 Are you looking to create a wanted poster for fun? Well, you can take to western wanted poster template example here which comes up with a rugged vintage look- that deftly emulates a wild west aura. These posters feature a stained yellow look to bring alive the rustic enigma of wild west. 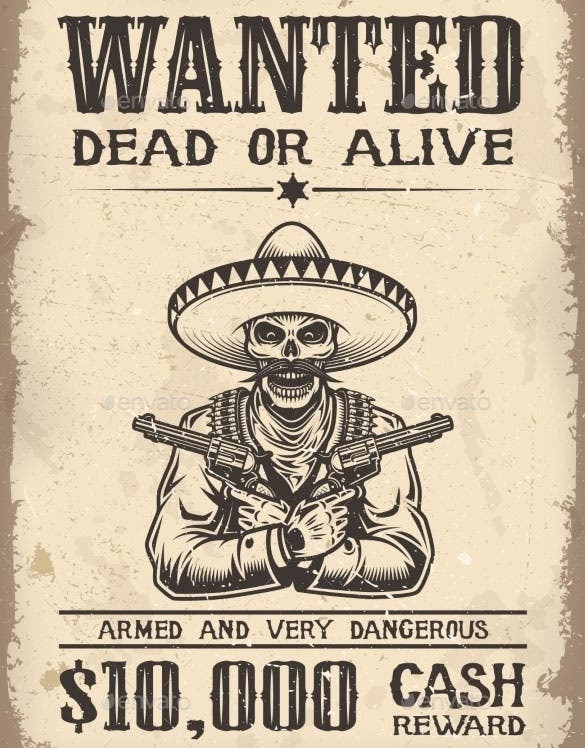 Wanted posters are primarily used by law enforcement officials to search for the escaped criminals but these posters also make fun time-passes as well. 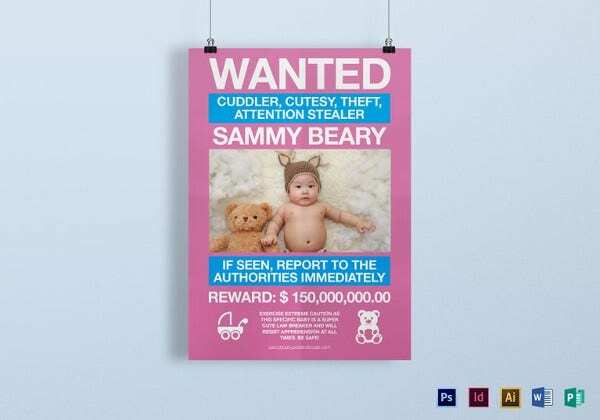 If you are looking to design a wanted poster for fun with friends, you can take to readymade & customizable wanted poster template publisher sample for convenient designing. images.brighthub.com | The reward for live capture poster template is a simple and easy to edit template. The user can add the image of the wanted person along with details of why he is wanted. The template has a ochre brown background and is absolutely free of cost. 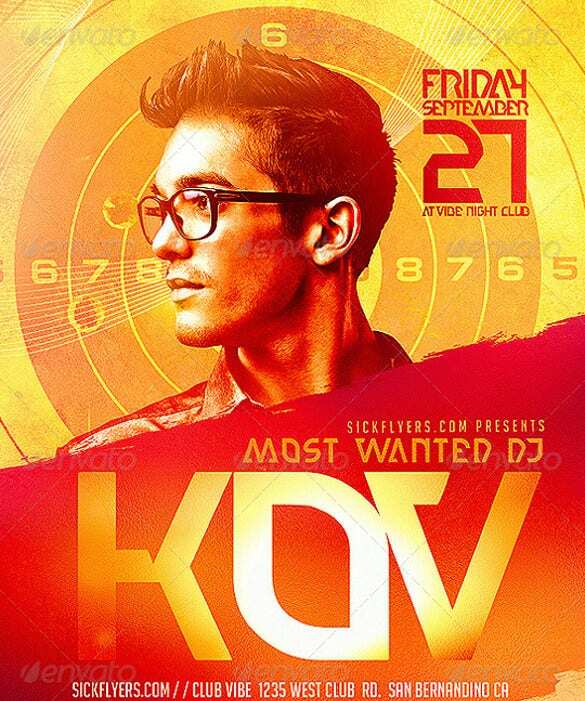 The most wanted flyer template PSD is a paid poster template. This poster is ideal for advertising international DJ music concerts. It has a bright and vibrant orange-yellow background and the picture of the DJ can be added to it along with the details of the date, time and venue of the show. A most wanted poster template example generally comes with one or multiple head shots of an escaped criminal. The photos are followed are preceded by details on the criminal’s name, notorious crimes committed, the reward announced, whether he is wanted alive or dead as well as where to contact if found by anybody. 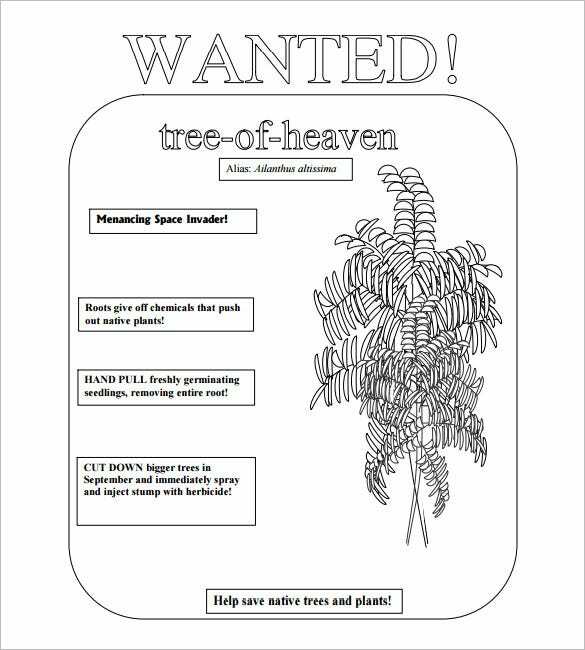 A lot of smart teachers use wanted poster template for kids word doc for the story classes. These templates are offered to kids to create a profile about the villainous characters they find in their stories. The template can be customized with the picture of the villain, name, crime and a concise description. 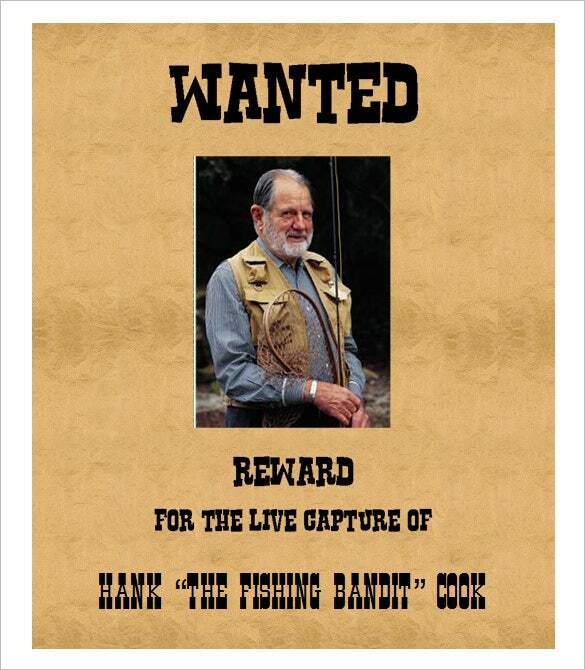 FBI releases wanted posters to inform public about a dangerous criminal who is wanted by the law. An FBI wanted poster template sample comes with a picture of the criminal along with pertinent details such as name of the person and crimes committed by him. Some of the posters might also include a reward value. 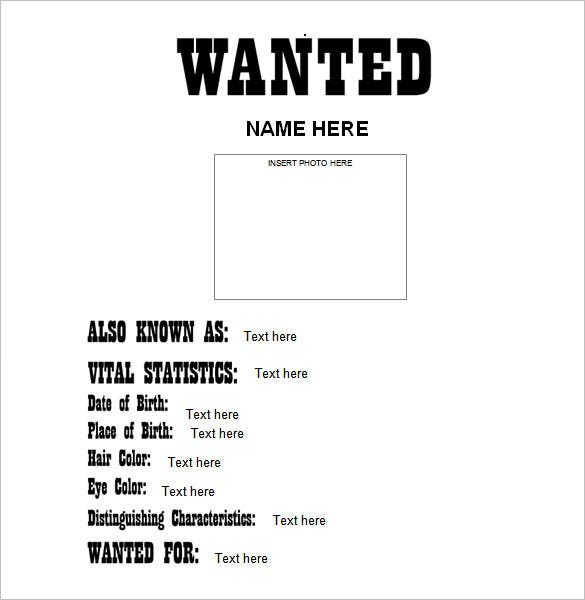 A blank wanted poster template word doc is just the thing you need when you are looking to create a wanted poster. There is a wide variety of these templates out there with backgrounds ranging from vintage to torn aged to wooden to rustic Wild West to samples with bullet holes as well. The old west wanted poster template sample examples make really interesting wanted posters, sweeping one to that vintage era. These posters come up with a faded and tinted yellow background accompanied by typical old west motifs such as guns, big nails, wooden backdrop, bullet shots, sepia image and so on. A help wanted poster template word doc is really useful when you are looking for a suitable employee for a sudden vacancy in your company. It’s short and concise and just contains the basic information such as the title of the post, the working hours and the wage. It should also contain your contact details. 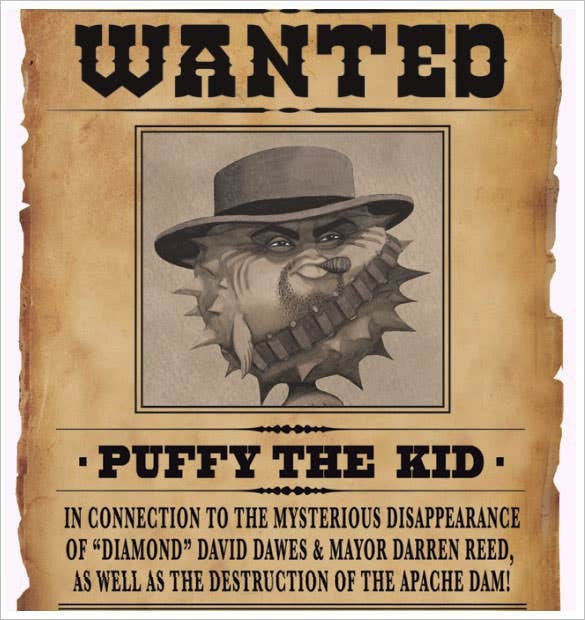 If you are looking to create a stylish wanted poster, take to wanted poster template Photoshop example. These readymade and easily customizable templates come in a wide range of interesting themes ranging from wild west to posters with wooden backdrops to posters based on certain super hit flicks such as Van Helsing. 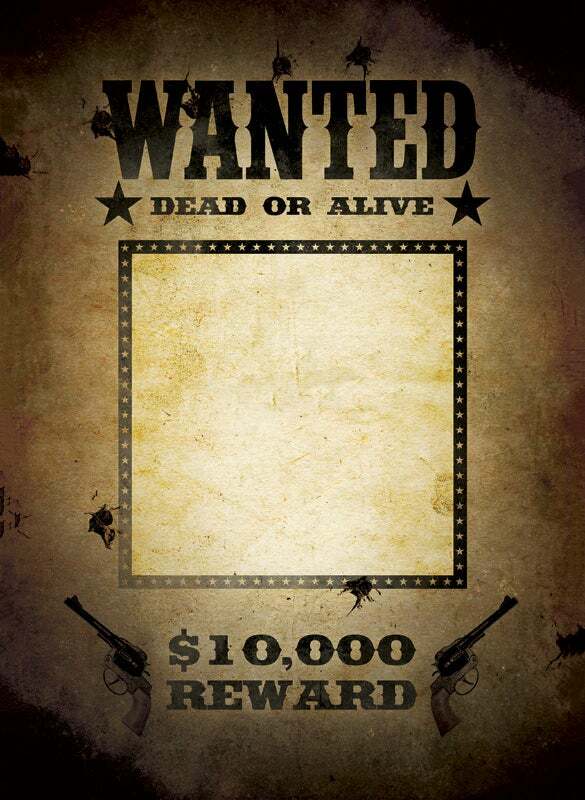 A wanted dead or alive poster template is especially meant for wanted posters based on Wild West theme. 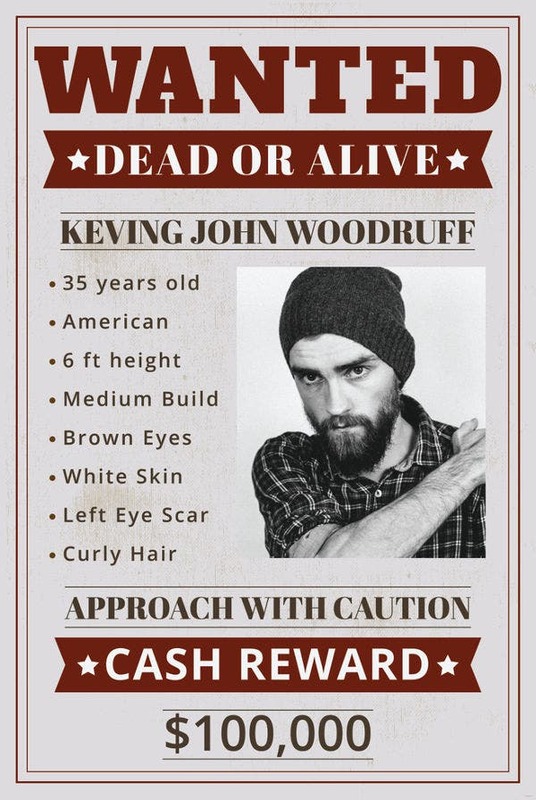 These posters come up with one big headshot of the criminal followed by his name, crime, the “dead or alive” declaration as well as the reward amount for anybody who finds him. 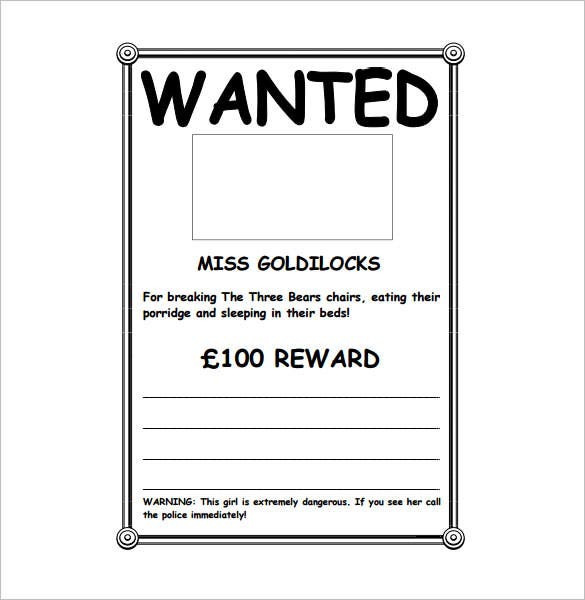 Teachers often use wanted poster template ks1 sample for KS1 students to make the story classes more interesting for them. 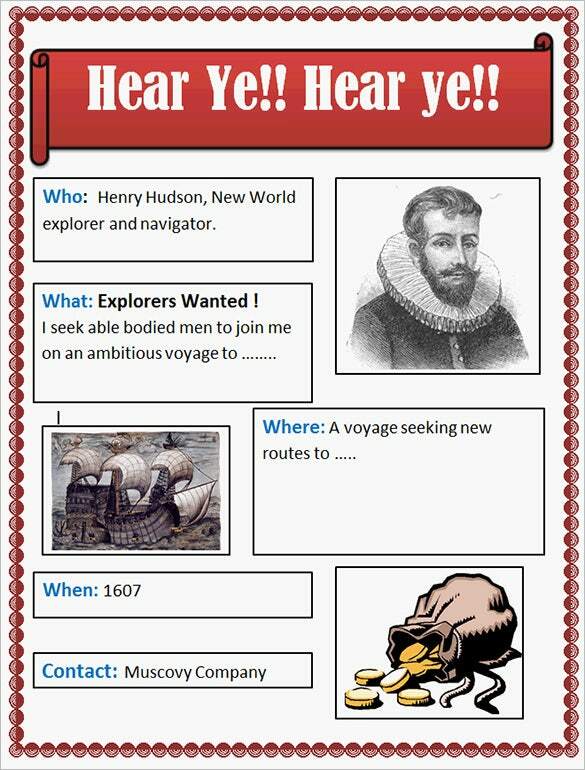 The students are often asked to create a criminal profile as followed by wanted posters for the villains they find in their stories and these readymade templates act as a handy help here. 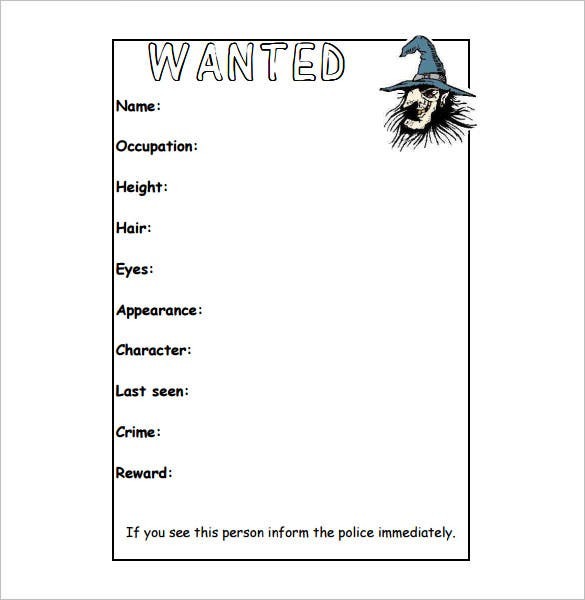 A wanted poster template ks2 example is an innovative way to engage students actively in their story classes. 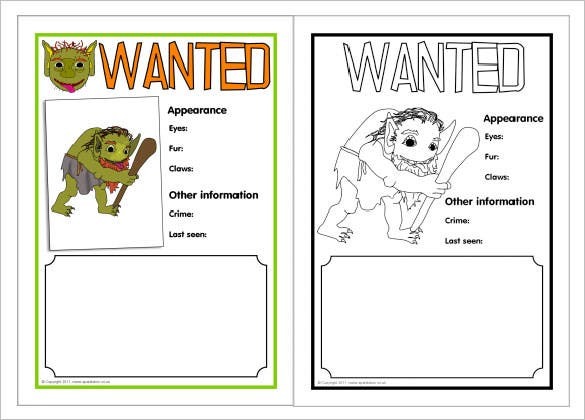 These templates offer space for a picture, name, crimes committed by the person and a short description by the students which the little ones can used to create wanted profile on the villain characters from their stories. 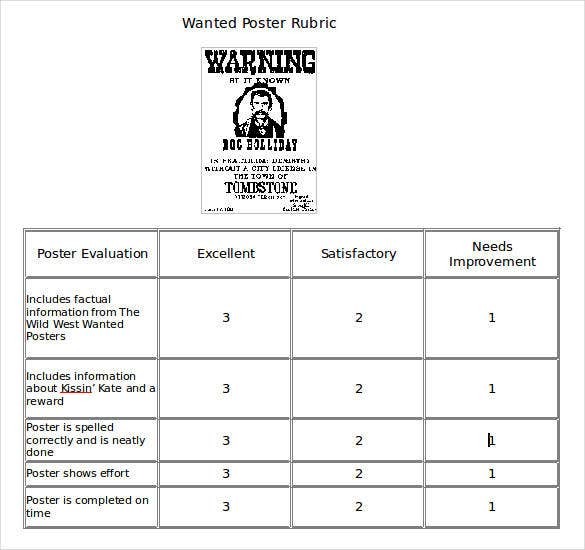 A wild west wanted poster template sample helps to make amusing wild west wanted posters. 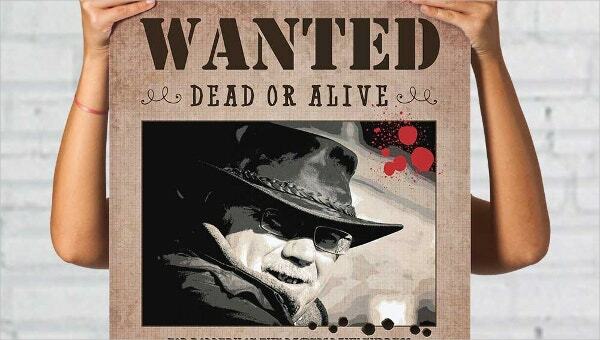 These templates are designed with the typical rustic ambience of the wild west with faded yellow backdrops often on a wooden background- accompanied by huge nails on 4 sides of the poster or big guns or the “dead & alive” declaration. A wanted poster example sample usually contains 1-3 headshots of an escaped criminal that the police are frantically searching for. Added to the photo, the poster will feature name of the person, the crimes that he have committed and sometimes a reward value. A lot of posters also provide a detailed contact information on whom to contact in case somebody gets hold of the wanted person. 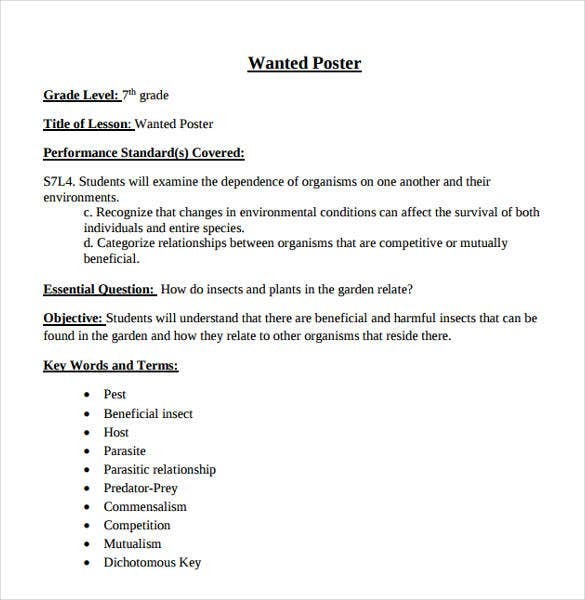 A sample wanted poster template word doc can come in word doc and offers a pre-structured, easily customizable framework for you to design the poster. You will have no-cost word doc download advantage. However, these sample templates are even available in PSD and Microsoft Publisher formats. These are great time savers no doubt. 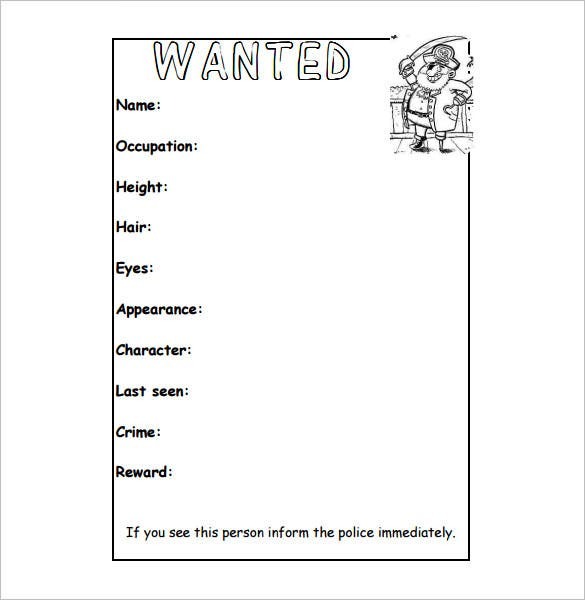 If you are looking to create a wanted poster, take to a Printable wanted poster template sample. Here you will find easily modifiable readymade poster backdrops so that you don’t have to design the entire thing from scratch. These printable templates are available in wide range of themes, ranging from rustic old wild west to Hollywood movies. 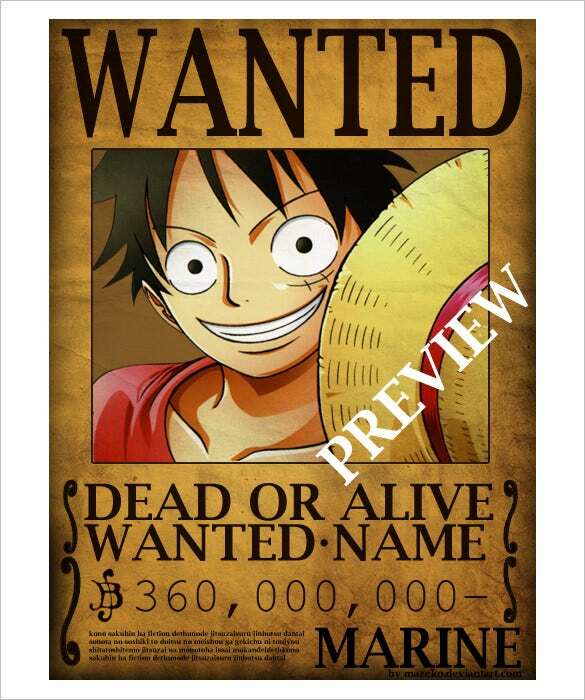 Now you no longer need to hunt for the perfect wanted poster template. Your hunt ends here. All your wanted poster requirements can be found under one roof. Just select one from the above mentioned list that best suits your requirement, edit it quickly, print it out and you’re all set to go. 25+ Creative Advertisement Posters You Must See Today!